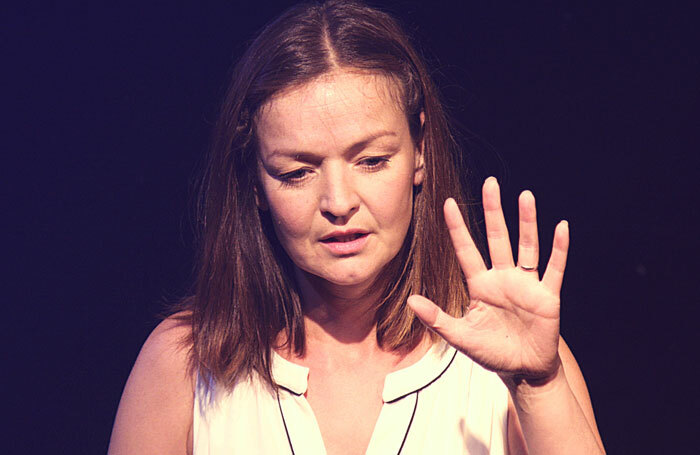 Linking together several non-linear storytelling strands, Never Vera Blue by Alexandra Wood addresses the experience of domestic abuse and violence. From subtle manipulation to attacks on self-esteem and increasing isolation, the play seeks to expose this destructive world from the inside out. While its inevitability is telegraphed from the start, it’s still a creative approach to a difficult subject. A woman (Laura Dos Santos) is struggling to recall a story about a soldier who is hiding from the enemy. She’s recounting conversations between Little Red Riding Hood and her grandmother in the belly of a wolf. But most of all she’s trying to explain to us how she came to be locked out of her house when her husband changed the locks without telling her. With subtle changes in lighting and tone, she shifts from one narrative strand to another, mixed with various memories of their relationship. She keeps trying to pin down what she “knows” to be true as her husband gaslights her. Dos Santos’ careful performance lets the character’s progressive and repeated rationalisations unfold and then build up to the moment where, finally, she can see this all only as abuse.